Spicy Treats: Eggless Marble Cake / Eggless Marble Loaf Cake / Chocolate Vanilla Loaf Cake~ For 5 Lakh Hits!!! Eggless Marble Cake / Eggless Marble Loaf Cake / Chocolate Vanilla Loaf Cake~ For 5 Lakh Hits!!! At last my long time wish to bake a Marble cake n Zebra cake was happened Yesterday. Yaay...I baked a Marble Cake!!!!... 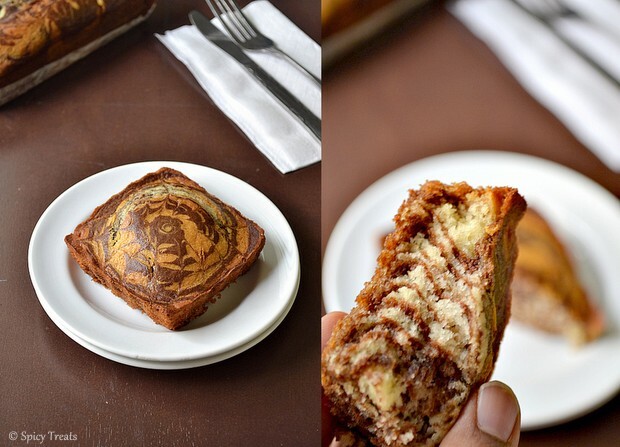 Long back i bookmarked this Eggless Marble Cake from Sharmis Passions. And at last Yesterday baked it as a Celebration Post recipe for my Blog's 5 Lakh Hits and completely enjoyed making it. He starred at me and replied in single line..".this is toooo much, You do as you like, no one is here to control you"
I tried to convince him but he ??!!!! In a bowl/plate, Sift all purpose flour,baking soda, baking powder and keep aside. In another mixing bowl, beat butter for few seconds until cream and then add sugar n continue beating for 1 or 2 minutes. Then add Vanilla and condensed milk then beat to combine. Now add flour and milk alternatively - start with flour and end with milk. combine everything well and do not over beat. And now, in a small bowl add 2tbsp cocoa powder n 2 tbsp hot water and mix well to a smooth liquid. After that, transfer 1/4 th of the vanilla batter to another bowl and mix it with prepared cocoa. Now both Vanilla n cocoa batter is ready. Line a 8" loaf pan with parchment paper and spray with cooking spray or grease the sides with butter and line with parchment paper. Now to the lined loaf pan, add vanilla n cocoa batter alternatively like a checker board pattern or simply fill with vanilla batter then add remaining cocoa batter in 3 small circles, make swirls as u like. Tap the pan gently to set the batter evenly and bake it for 35-45 minutes or until done(check by inserting a knife or toothpick which should come out clean). Condensed milk can be replaced with milk powder. The entire batter can be baked in 8" loaf pan, as its my first time i don't know h much the cake will rise so filled half only and baked the left over in mini pan. Congrats and the cake looks great! Congrats and cake look so delicious so apt for the celebration. Congrats on ur 5 lakh hits...lovely preparation and presentation, lovely pics too!! Congrats, definitely time to celebrate, cake looks great and your clicks are simply awesome..
Great Milestone Sangee. Congrats. Cake came out super perfect. love to taste it. Great Achievement and congrats on the milestone .. Looks yummy !!!!!!!!! Congrats!!!! Cake looks super delicious. Lovely clicks. looks so delicious and came out so good... very impressive!! Congrats on your 5 lakh hits.. Your cake is definitely irresistable!!! My hearty congratulations Sangee...wish you more success. BTW, awesome picture, love the clean marble effect on the cake. I'm still waiting to try. congrats on the 5 lac hit!! loved the marble effect! the best one i've ever seen! Delicious and mouthwatering cake Lovely preparation. that pattern is simply amazing sangee and i m glad to see you are back on your feet! 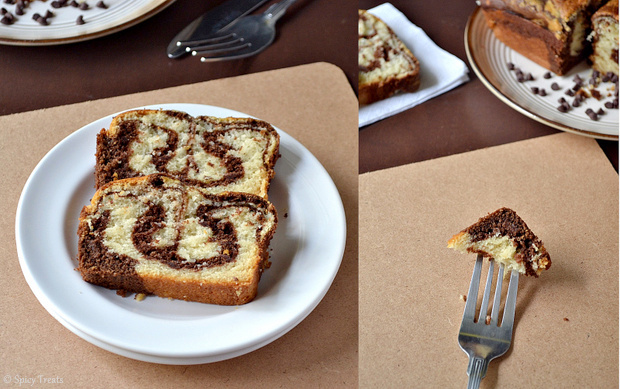 Love the pattern of your marble cake Sangee,loaf looks extremely irresistible. Btw regarding your q'n about the burfi,yep you can replace very well the chocolate powder with cocoa powder,but the colour will be bit darker than mine,thats all. Congrats on your blogs 5th anniversary. Sometimes, when the kids are sick and you have not been blogging, the need to blog increases. The cake looks awesome. What a beautiful pattern! Congrats! Very nice and wonderful cake. You got the exact pattern too. Thanks for trying out the instant sambar. Dear sangeetha, i had booked marked this receipe for a long time and yesterday was the day that i had prepared this cake. This was the most moist and perfect eggless cake that i have made.. thank you so much. hope to see much more eggless variation from you. Hello, I wanted to let you know that I tried out your recipe and loved it! I made a few substitutions due to the ingredients I had available and it still worked. I used soy milk instead of regular (and condensed), light margarine instead of butter, and four handfuls of melted chocolate chips instead of cocoa/water. I ended up doing 50% vanilla and 50% chocolate as I am a big chocolate fan... it was moist and delicious! Thanks for posting. Hi Sangee, in your notes, u have mentioned that Condensed Milk can be substituted with milk powder. so for 4 Tabsp of condensed milk, hw many spoons of milk pwder will b enuff? You can use 2 or 3 tbsp milk powder, but i haven't tried it. Hope it will workout. If you try, please do share your feedback.